City gets its first hitching post in nearly a century. For the first time in about half a century, a hotel on Johnston Road in Port Alberni has had hitching posts installed for its equestrian business. 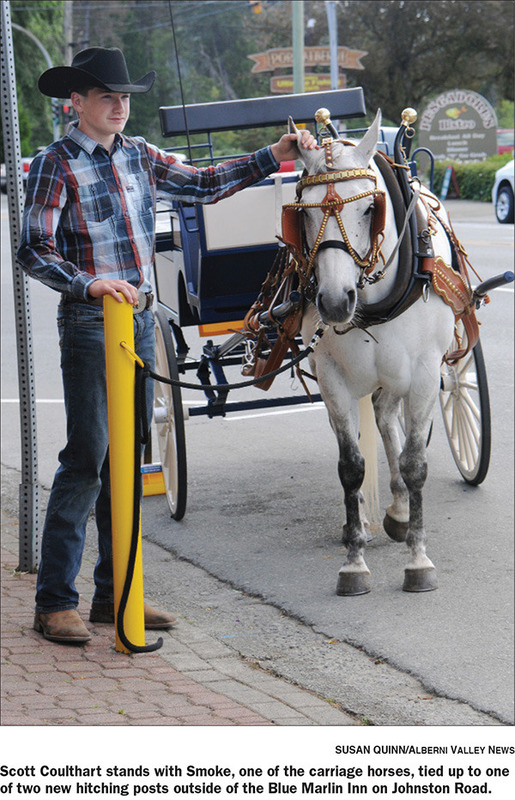 The Blue Marlin Inn has installed two hitching posts to accommodate their summer horse and carriage rides, which Dana and Kerry Salisbury of Beaver Creek provide every week. This is the second year the Blue Marlin is offering carriage rides during the summer. Last year wranglers tied the horses to a signpost or had to hold onto them. The Blue Marlin Inn has only been called so for not quite three years; it was built in 1893 by Matt Ward as the Arlington Hotel, and remained so at the corner of Johnston Road and Margaret Street until it was sold in 2012. The Arlington was the second hotel to be built in Alberni. The three-storey building had a large veranda on the front, included a dining room that sat 90 as well as a “modern” saloon. Jack Burke and Harry Fitzgerald opened the Alberni Livery Stable across Margaret Street from the Arli, which complemented the hotel and saloon. The livery was a mainstay on the corner until the 1940s, when Chatwin Motors took over. No records could be found at the Alberni and District Archives about when the Blue Marlin last had a hitching post, museum executive director Jamie Morton said. The switch to electricity in the building in the early 1900s was more notable, and was even marked in minutes from a February 1913 Alberni city council meeting, during a report on the matter. 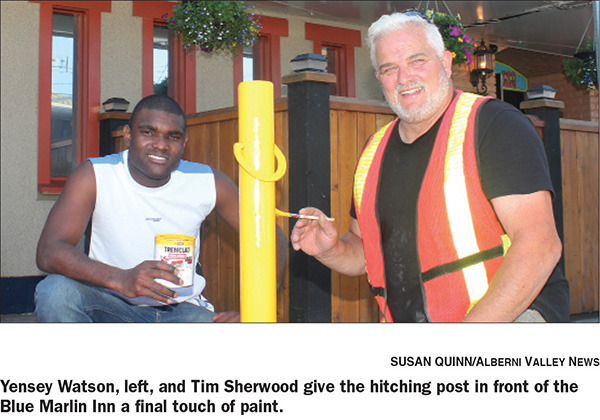 Tim Sherwood installed the two new hitching posts after gaining permission from city planner Scott Smith and painted them bright yellow (so motorists can see them). the posts are made from steel pipe courtesy of Dast Welding, and sunk two feet into concrete to keep them stable. Sherwood used horseshoes from one of his own horses to create the tie-ups. “I was going to use my draft horse’s shoes but they were way too big,” he said. He installed two posts and two hooks in the breezeway “so when the sun moves they will move the horses around the corner,” he said. The horse and carriage rides will be offered every Thursday through Sunday in the summer as well as during special events. The inn offers the carriage rides to tie in with the heritage theme of the establishment, said inn spokesperson Sue Hopkins. “Susan is our cousin and we’ve been doing this for many years,” Kerry Salisbury said. “(The Blue Marlin’s owners) were looking to for somebody and she automatically thought of us. 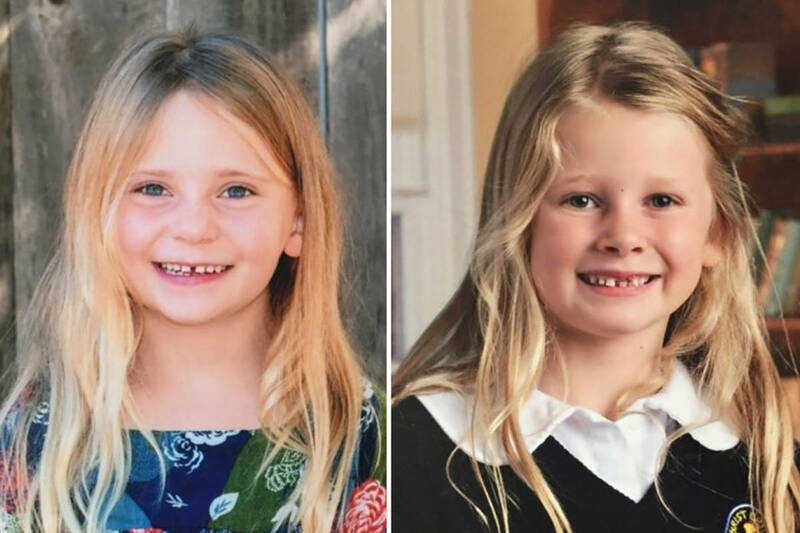 I think it’s something that’s going to do well here,” she said. The routes they take vary, says Dana Salisbury. “We have a few different routes depending on the length of the ride you want to go on,” she said. Reservations can be made by calling the Blue Marlin at 250-723-5663. The carriage traverses the blocks around Johnston Road and Victoria Quay, Margaret Street and up to Roger Creek Splash Park, and even along Stamp Avenue to Harbour Quay and back for the longest route, she said. “We try and incorporate some of the history, especially with the hotel, Salisbury said. “Talking to some of the oldtimers too, they have stories.